I. Theoretical Approaches to the Industrial/Organizational Field. 1. The Theory and Structure of Industrial/Organizational Psychology (G.M. Alliger). 2. The Implications of Attraction Research for Organizational Issues (D. Byrne, J.H. Neuman). 3. Taking Things a Bit Too Far: Some Problems with Emergent Institutional Theory (R.H. Hall). II. Traditional Areas of Research in Organizations. 4. Another Look at Personality and Managerial Potential: Application of the Five-factor Model (J.R. Lillibridge, K.J. Williams). Team Building and Its Influence on Team Effectiveness: An Examination of Conceptual and Empirical Developments (S.I. Tannenbaum, R.L. Beard, E. Salas). 6. Perceived Self- competence and Organizational Behavior (K.J. Williams, J.R. Lillibridge). 7. Current Trends in Managerial Training (B.M. Racicot, R.J. Hall). 8. Organizational Needs Assessment: Technology and Use (B.A. Caska, K. Kelley, E.W. Christensen). III. Issues of Concern to the Individual in Organizations. Health in the Workplace (D.M. Ashcraft). 10. The Role of Gender in Organizations (K. Kelley, D. Streeter). 11. The Dynamics of Ethnic Diversity in Organizations: Toward Integrative Models (B. Ferdman). 12. Stigmas in Organizations: Race, Handicaps, and Physical Unattractiveness (E.F. Stone, D.L. Stone, R.L. Dipboye). Name Index. Subject Index. Industrial/Organizational psychologists are a rather diverse group of people with a common interest in applying psychology to work settings. This is the conclusion reached by George Alliger in the opening chapter of this volume, setting the tone for the rest of the book, which attempts to expand our view of what can be considered as I/O psychology. 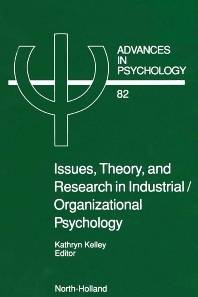 The authors of the individual chapters are from a variety of backgrounds, not all of them directly associated with I/O psychology, and they discuss topics such as managerial success and training, as well as topics much more on the edge of I/O such as team-building and organizational theory. Thus, this volume makes an important statement about the potential diversity of our field. At the same time, it will help move us towards that diversity by providing insights and information in areas that should be, and are becoming part of the realm of I/O psychology. These insights into non-traditional topics, as well as particularly interesting approaches to more traditional areas, make this volume worthwhile and useful to almost anyone concerned with I/O psychology.